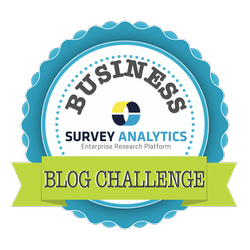 SurveyAnalytics Blog: Day 7: What is the Next Upcoming Event You are Attending? Day 7: What is the Next Upcoming Event You are Attending? In today’s modern connected world, it feels like a lot of our job can be done from nearly anywhere and on our own. Although we can likely reach people on the digital frontier, sometimes we have to get out of the office and refresh the perspective on our industry. Many online events and social media events have sprung and make it easy for us to connect and learn without going anywhere. But is it as valuable as the real thing? It is still important for your business to participate in real life events, even if they are on a rare occasion. In this article on the Salesforce Blog, they offer 4 Reasons Attending Events in Person is Still So Important. If you have a chance to skim through it, you won't be disappointed. They explain that if you remove yourself from your own four walls, you naturally think differently about things with a new set of stimuli. In addition to that, you can meet new people, strengthen existing business relationships, and just have fun. Let's not forget the obvious here - you will also learn a thing or two and keep your business skills sharp by attending an occasional event. With that said, we wanted to highlight some of the events coming up that we are excited about attending. The next event we are attending is the gsummit 2014 that kicks off this week in San Francisco. The gsummit is a user-engagement and gamification conference that aims to bring effective engagement strategies and design back into your company. In this day and age, there are more distractions than ever. To overcome this we have to win back the attention of our customers, employees, and consumers. We are excited to be attending gsummit and expect to learn a lot about gamificaion and user-engagement, as well as make a few new friends. After gsummit, our Marketing Team is heading to INBOUND 2014 in Boston this September. Inbound is HubSpot's annual user conference that aims to provide the inspiration, education and connections you need to transform your business. At Inbound, we are expecting to be surrounded by rich education and training, remarkable content, networking opportunities, and some live entertainment too.